On the occasion of Christmas, Apex Kidney Foundation had arranged ‘Secret Santa’ for all the dialysis patients. This secret santa was carrying gifts for all patients. These gifts included tourniquet belts, stress balls, medicine boxes, etc. On 25th December one Santa visited to 5 centers managed by Apex Kidney Care i.e. 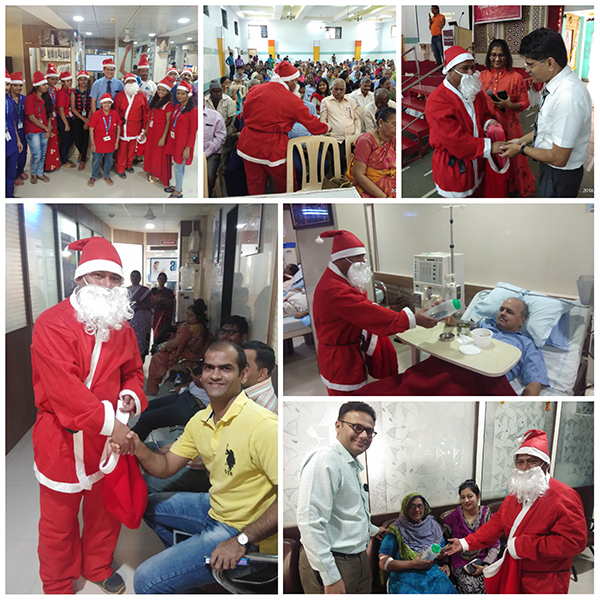 Kalyan, Mululnd, Hiranandani hospital and also Santa visited to 5 centers i.e. Sushrut hospital and research center, Zen multispeciality hospital, Raikar hospital, Rajawadi hospital, Shatabdi hospital. On 26th December Santa visited to 3 centers i.e SRV Hospital, Lalbaugcha raja dialysis center, Prabodhan dialysis center. Santa had given gifts and Chocolates to Dialysis Patient. These gifts includedtourniquet belts, Medicine Boxes, etc. Patients were delighted to meet the santa claus. Patients were very happy they have clicked the photos with santa claus. Staff of Apex Kidney Care of all the center were also been in Red Dress Code with Santa cap and clicked the photos with Santa. All had a great time!